As we approached the airport in Kathmandu, after many hours of travel through London and Delhi, I got two impressions: (1) Why were there pallets of what appeared to be aid stacked on the side of the airport, and (2) The city was still standing- maybe the devastation was not so bad….? Unfortunately, my first impression was based on reality. After we landed, we were advised that much well intended aid had not yet made it out of customs to assist the earthquake victims. Tragically, I found out over the next few days, that my second impression of the city was not based on reality. I had only glimpsed a few areas that were not that badly damaged. My co-KIRF volunteer and fellow Rotarian, Steve, and I came to realize that the devastation to Kathmandu and Nepal is immense, affecting most of the city and the countryside in the region. The earthquake’s massive destruction became apparent on the first day of assessment work, when I went for an early morning jet-lagged run through the Pashupantinath Shiva Temple next to the Hotel Indreni where we are staying. Sadly, like many of the older structures throughout the Country, it had suffered severe damage from the earthquake. The night before we had a meeting with people from the local Rotary Club of Bagmati, such as the charismatic Akhil, and a member of the Kathmandu Lions club, Anoj (our lead contact, and brother of the very generous supporter of this trip-Anup, the owner of our local Ventura restaurant Himalaya). We decided at that meeting that their Rotary Club past president (who turned out to be a very kind and generous man in is how measure for the local community- assisting the poor with education and micro finance for local women) Bidur would be our guide to help us assess some rural hill villages about 2 ½ hours outside of Kathmandu. The next day, Friday, May 15, Bidur drove us, and another Bagmati Rotarian, Bijay, on dirt roads through the steep hillsides and sub-tropical forest area just outside of Kathmandu, using four wheel drive to access the villages. After several hours of driving, we stopped on the side of a hill because a slide had blocked the road. This is where we met Mr. Shakya who told us that most of the 55 houses in the village of Hille were destroyed by the quake. In Hille we walked through the village, meeting families and talking with the men and women who had suffered great losses as we assessed the damage and found out what they needed. Next we traveled to another village nearby named Kharse where 50 houses had been severely damaged. Again, through our local interpreter we spoke with the men and women of the village and then, after being offered tea, we discussed their roofing material needs. From these assessments speaking with the earthquake survivors, we learned that they did not need food, clothes or water. Unanimously they told us they needed shelter: the monsoons were only six weeks away. (!) We discussed their needs with them and they told us that they could reuse some of the materials from the destroyed houses, and acquire wood from the forests if needed. However, they desperately needed building materials for roofs. They decided that the most economical and safest shelters they could rebuild would be one story homes with wood walls and zinc (corrugated sheet metal) roofing. Each new home would take about six days to build. Each house needed 12 sheets of 12’ x 3.5 feet zinc or two bundles of zinc which are sold locally in groups of six sheets. We determined that they needed more hammers, tin snips and nails to build the structures. The photos below are of one such structure that one of the elders built after the earthquake in Hille village. We decided that we had enough donated funds to purchase enough zinc to rebuild the roofs in the villages of Hille and Kharse, or a total of 105 homes. The next day, May 16, we traveled to what we were told was the low cast community of the Putuwar family which lives in Ichngo. As I have seen on many previous trips, it is often the urban poor who suffer the most from disasters because of the do not have access to food as the day labor jobs cease. This was especially true in Nepal with back to back major earthquakes. Over half the city population had left Kathmandu after the second quake because safty fears and to be with their families in the country. Ichango had about 100 homes, 68 were totally destroyed. According to the people of Ichango , the best aid that we could provide them was enough rice and soy protein to sustain one family for a week and some waterproof tarps for temporary shelter. This area was very close to a government station and we were told that the residents hoped that they would be able to secure the badly needed zinc through their government representative (who helped us assess needs in the bottom right picture). Later that day we visited the village of Champi, about an hour drive from Kathmandu. In this area, the local wildlife and the villagers routinely come into conflict in tragic ways. We were told that about four people per year are killed by leopards or tigers. In this village I was able to interview a man (lower picture to the left, he standing to the far right of photo) who was 94 years old. He told me that he was living when the last big quake hit Nepal approximatly 84 years ago. He told me that the the houses were only one-story then and less lives were lost due to falling walls. A story that many Nepalese repeated to me. I also heard from local people that the death toll of the current earthquake disaster was well over 10,000 people, with many people tragically still missing underneath the rubble. In the photo below the man to the left is pointing to where the sister of other man, standing to the right, was killed. He is still wearing his white mourning clothes. Yet, there is still much hope for the children. The next few days were spent negotiating prices for rice, soy protein, zinc, nails and tools. We then delivered the rice and soy protein to the village of Ichngo. The Bagmati Rotarians and Roteracts delivered the zinc to the villages later after some serious on-site negotiations regarding distribution! 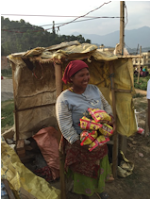 Many thank you's to all who helped and partnered with KIRF to make this Nepal relief trip a success!